Download Our FREE Phone App! NO SURGE PRICING! No Credit Card Required – You Can Pay with Cash! What platform is the phone app available in? Our app is available in iOS and Android platforms. Visit either the App Store or Google Play to download the app free. May I order a ride for a later time? No, we have not incorporated ‘time calls’ into our app. However, if you wish to reserve a ride for a future time, you are always able to do so by calling our main number, 319-338-9777. Do I need a credit card to pay through the phone app? No! 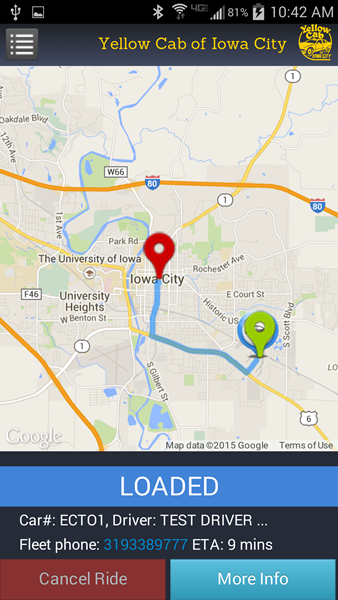 With our app, you can pay with cash, credit/debit card, or with a Yellow Cab of Iowa City Gift Card. If you enter a card number after downloading our app, the app with ask for each ride whether you’d like to use the card you have on file, or whether you’d like to pay a different way (pay the driver directly). Can I cancel my ride if my plans suddenly change? Yes. At any time before your car arrives, you can press the ‘cancel ride’ button without penalty. At this time we do NOT charge a cancellation fee. Does the phone app accept tips? Yes! After your ride is complete, the app will ask you to review your trip and allow you to enter a gratuity for the driver. Will the app let me know when the cab has arrived? Yes. 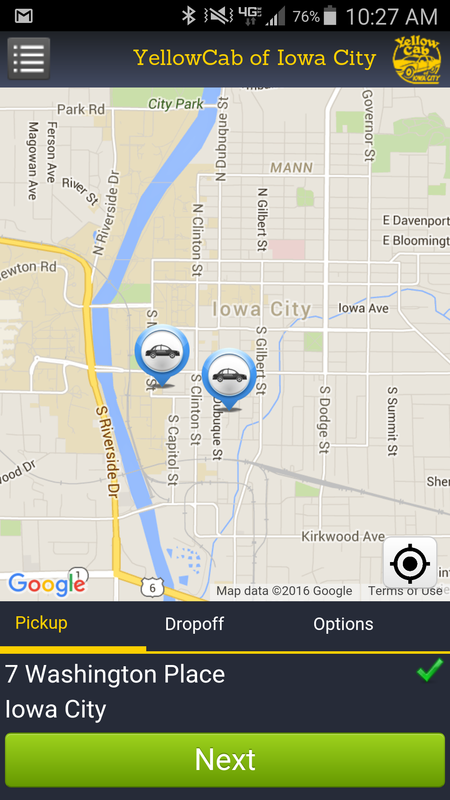 Our app will provide a ‘ding’ sound and your screen will tell you the car has arrived. Does your phone app have surge pricing? How do I get an estimate for my trip? Once you have entered into the app the pickup location, destination, and any comments/instructions, the app will ask you to review your entry. 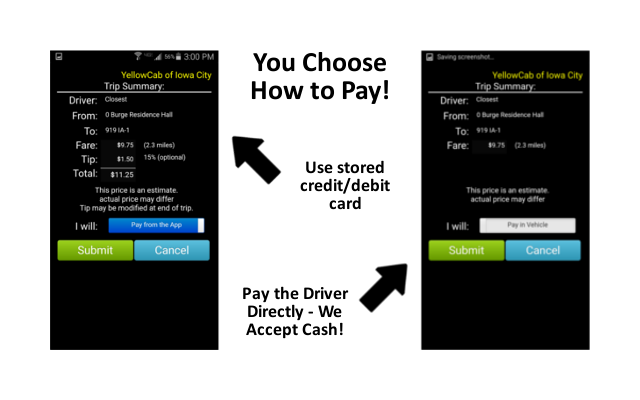 At that time, the app calculates and shows the estimated fare based on the information you provided. Can I get a receipt for my trip? Yes! The app will automatically email you a receipt. Are there any extra fees for using your app? No. There are no extra fees charged for using our app. Trips on our app are charged our regular rates. 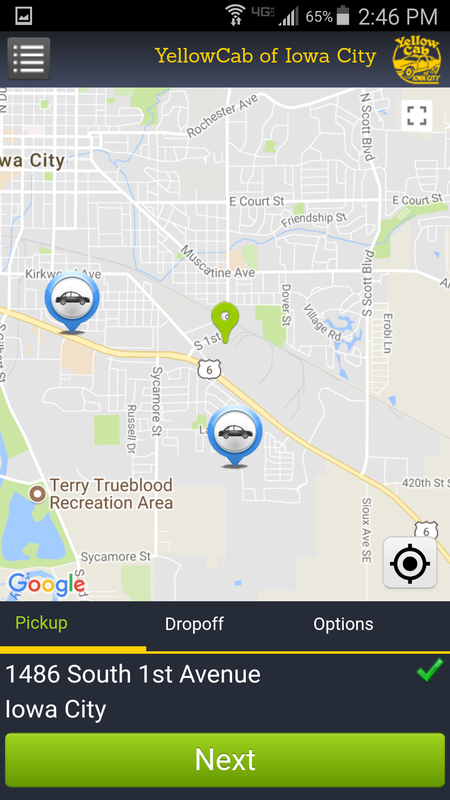 Can I rate my driver when my trip is complete? Yes! Once your trip is over, the app will allow you to rate the trip. Please take a moment and let us know how we’re doing! At no time will the driver see the rating for your trip. Are your drivers subject to background checks? Yes! ALL of our drivers have background checks done prior to joining our driving staff. Plus, ALL of our background and motor vehicle record checks are performed by an independent third party, and screened by the Iowa City Police Department. 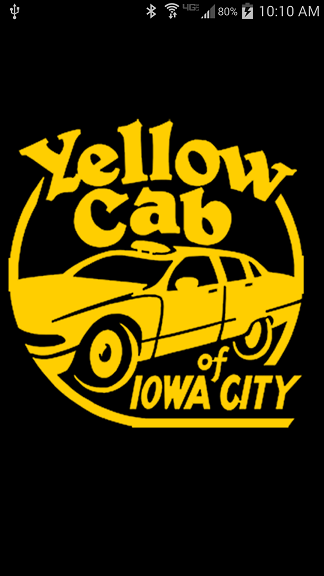 If the driver is not approved by the Iowa City Police Department, he/she cannot drive for Yellow Cab of Iowa City.